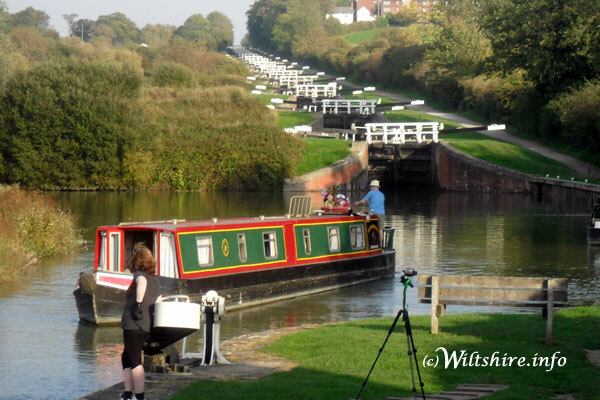 The Kennet and Avon Canal offers one of the most scenic boating holidays. It links Bristol in the West to the River Thames in the East, going through some delightful Somerset and Wiltshire countryside settings including the Southern tip of the Cotswolds and historic towns such as Bradford-on-Avon and Bath. The Canal passes through the 29 locks at Caen Hill near Devizes, which was one of the most advanced engineering achievements of the Canal period. See the photo above. Here are the Boating Holidays that we have available on the Kennet And Avon Canal. Aldermaston Wharf is well positioned for cruising the picturesque and peaceful Kennet and Avon Canal and the River Thames. All the narrowboats are designed and fitted to make the best use of space with quality fittings and furnishings throughout. Aldermaston Warbler|4 double, 3 double and 2 single or 2 double and 4 single.| Semi-traditional stern ToasterVacuum cleanerEnsuite hip bath with overhead shower and electric flush WCShower with electric flush WCLayouts may vary in this class|21.03m (69ft)|Spacious narrowboat sleeping up to eight. Aldermaston Lark|3 double, 2 double and 2 single or 1 double and 4 single.| Semi-traditional stern MicrowaveToasterVacuum cleanerSecurity safeFitted carpets (saloon and cabins)2 shower and electric flush WCs|20.12m (66ft)|Spacious, modern narrowboat with a high quality finish. Aldermaston Eagle|3 double, 2 double and 2 single or 1 double and 4 single and optional pull down high level single berth in forward cabin.| Cruiser stern 240v systemMicrowaveToasterVacuum cleanerFitted carpets (saloon and cabins)Security safeHip bath with overhead shower and electric flush WCShower with electric flush WC|20.12m (66ft)|Charming narrowboat with clever sleeping design. Aldermaston Dove|3 double, 2 double and 2 single, 1 double and 4 single or 6 single.| Cruiser stern 240v systemMicrowaveToasterVacuum cleanerFitted carpets (saloon and cabins)Security safeInterior sprung mattress on fixed berths2 shower with electric flush WCs|18.29m (60ft)|Spacious narrowboat with flexible sleeping options up to six. Aldermaston Owl|4 double, 3 double and 2 single, 2 double and 4 single, 1 double and 6 single or 8 single and 2 optional pull down high level single berths in forward and rear cabins.| Cruiser stern 240v systemMicrowaveToasterSecurity safe2 shower/WCs|21.34m (70ft)|Narrowboat sleeping up to ten, perfect for large groups or two families. Aldermaston Thrush|3 double, 2 double and 2 single or 1 double and 4 single.| Semi-traditional stern 240v systemMicrowaveToasterVacuum cleanerFitted carpets (saloon and cabins)Security safeHip bath with overhead shower with electric flush WCShower with electric flush WC|20.12m (66ft)|Spacious 66ft narrowboat for parties up to six. Aldermaston Swan|2 double and 8 single, 1 double and 10 single or 12 single.| Cruiser stern 240v systemMicrowaveToasterSecurity safe2 shower/WCs|21.34m (70ft)|Large narrowboat with flexible sleeping arrangments for up to twelve. Aldermaston Gull|3 double, 2 double and 2 single or 1 double and 4 single.| Cruiser stern 240v systemMicrowaveToasterVacuum cleanerFitted carpets (saloon and cabins)Security safeEnsuite hip bath with overhead shower and electric flush WCShower with electric flush WC|20.12m (66ft)|Large narrowboat with extensive rear deck area. Aldermaston Weaver|2 double or 1 double and 2 single.| Semi-traditional stern 240v systemMicrowaveToasterVacuum cleanerFitted carpets (saloon and cabin)Security safeShower with electric flush WC|14.32m (47ft)|Narrowboat with flexible sleeping arrangements. Aldermaston Woodpecker|3 double, 2 double and 2 single, 1 double and 4 single or 6 single and 2 optional pull down high level single berths.| Cruiser stern 240v systemMicrowaveToasterFitted carpets (saloon and cabins)Security safeInterior sprung mattress on fixed berths2 shower with electric flush WCs|18.29m (60ft)|Large narrowboat with open stern area ideal for socialising. Aldermaston Bunting|2 double or 1 double and 2 single and optional pull down high level single berth in forward cabin.| Cruiser stern 240v systemMicrowaveToasterVacuum cleanerFitted carpets (saloon and cabins)Security safeShower with electric flush WC|14.93m (49ft)|Smart and practical narrowboat for a couple or small family. This historic base at Bradford Wharf offers outstanding cruising through the stunning scenery of the Kennet and Avon Canal towards world famous Bath, and historic Bristol Harbour, or into sublime scenery through the Vale of Pewsey including ascent of the famous Caen Hill Locks. Claverton|3 double, 2 double and 4 single or 1 double and 6 single.| New in 2016 Cruiser sternPicture windows in dining areaAll low level berthsBath with overhead shower/WCEnsuite shower/WC|18.28m (60ft)|Ideal canal boat for four &ndash; two cabins and modern facilities. Semington|2 double and 8 single, 1 double and 9 single or 10 single.| Cruiser stern 2 ensuite shower/WCs|21.03m (69ft)|Large well designed narrowboat for sociable boating. Bath|1 double and chairs in saloon convert to 2 single.| Cruiser stern Free standing furnitureAll low level berthsEnsuite bath with overhead shower/WC|14.86m (47ft 6in)|Well-designed narrowboat with a fantastic finish. Buckby|4 double, 3 double and 4 single, 2 double and 7 single or 1 double and 10 single.| Cruiser stern Picture windows in dining area2 ensuite shower/WCs|21.03m (69ft)|Perfectly designed large berth narrowboat with flexible layout for up to twelve. Braunston|4 double, 3 double and 2 single, 2 double and 6 single or 1 double and 8 single.| Cruiser stern 2 ensuite shower/WCs|20.12m (66ft)|Suitable for larger parties with flexible layout this narrowboat has all modern fixtures. Dundas|4 double, 3 double and 4 single, 2 double and 7 single or 1 double and 10 single.| Cruiser stern Picture windows in dining area2 ensuite shower/WCs|21.03m (69ft)|Ample amounts of space with flexible layout throughout this splendid narrowboat. Devizes|4 double, 3 double and 2 single, 2 double and 6 single or 1 double and 8 single.| Cruiser stern Picture windows in dining area2 ensuite shower/WCs|20.12m (66ft)|Spacious and comfortable narrowboat with flexible layout and a high quality finish. Wessex Warbler|4 double, 3 double and 2 single or 2 double and 4 single.| Semi-traditional stern ToasterVacuum cleanerEnsuite hip bath with overhead shower and electric flush WCShower with electric flush WCLayouts may vary in this class|21.03m (69ft)|Spacious narrowboat sleeping up to eight. Wessex Wren|2 double or 1 double and 2 single.| Semi-traditional stern MicrowaveToasterVacuum cleanerSecurity safeFitted carpets (saloon and cabins)Shower with electric flush WC|14.32m (47ft)|Narrowboat ideal for two couples. Wessex Lark|3 double, 2 double and 2 single or 1 double and 4 single.| Semi-traditional stern MicrowaveToasterVacuum cleanerSecurity safeFitted carpets (saloon and cabins)2 shower and electric flush WCs|20.12m (66ft)|Spacious, modern narrowboat with a high quality finish. Wessex Heron|2 double and 1 single or 1 double and 3 single.| Semi-traditional stern Solid fuel stoveMicrowaveToasterVacuum cleanerSecurity safeShower with electric flush WC|17.68m (58ft)|Comfortable narrowboat with fuel stove and flexible sleeping up to five. Wessex Bunting|2 double or 1 double and 2 single and optional pull down high level single berth in forward cabin.| Cruiser stern MicrowaveToasterVacuum cleanerSecurity safeShower with electric flush WC|14.93m (49ft)|Smart and practical narrowboat for a couple or small family. Wessex Eagle|3 double, 2 double and 2 single or 1 double and 4 single and optional pull down high level single berth in forward cabin.| Cruiser stern MicrowaveToasterVacuum cleanerFitted carpets (saloon and cabins)Security safeEnsuite hip bath with overhead shower and electric flush WCShower with electric flush WC|20.12m (66ft)|Charming narrowboat with clever sleeping design. Wessex Thrush|3 double, 2 double and 2 single or 1 double and 4 single.| Semi-traditional stern MicrowaveToasterVacuum cleanerSecurity safeHip bath with overhead shower and electric flush WCShower with electric flush WC|20.12m (66ft)|Spacious 66ft narrowboat for parties up to six. Wessex Grebe|2 double or 1 double and 2 single.| Cruiser stern MicrowaveToasterVacuum cleanerFitted carpets (saloon and cabin)Security safeShower with electric flush WC|14.93m (49ft)|Ideal for a couple or small family with large rear deck. Wessex Owl|4 double, 3 double and 2 single, 2 double and 4 single, 1 double and 6 single or 8 single and 2 optional pull down high level single berths in front and rear cabins.| Cruiser stern MicrowaveSecurity safe2 shower with electric flush WCs|21.34m (70ft)|Narrowboat sleeping up to ten, perfect for large groups or two families. Wessex Swan|2 double and 8 single, 1 double and 10 single or 12 single.| Cruiser stern Microwave2 shower/WCs|21.34m (70ft)|Large narrowboat with flexible sleeping arrangments up to twelve. Wessex Goose|4 double, 3 double and 2 single or 2 double and 4 single. | Semi-traditional stern MicrowaveToasterVacuum cleanerSecurity safeEnsuite hip bath with overhead shower and electric flush WCShower with electric flush WC|21.03m (69ft)|Spacious narrowboat sleeping up to eight. Wessex Gull|3 double, 2 double and 2 single or 1 double and 4 single.| Cruiser stern MicrowaveToasterVacuum cleanerFitted carpets (saloon and cabins)Security safeEnsuite hip bath with electric flush WCShower with electric flush WC|20.12m (66ft)|Large narrowboat with extensive rear deck area. Wessex Weaver|2 double or 1 double and 2 single.| Semi-traditional stern MicrowaveToasterVacuum cleanerFitted carpets (saloon and cabin)Security safeHip bath with overhed shower and electric flush WC|14.32m (47ft)|Narrowboat with flexible sleeping arrangements. Bath truly deserves its ’World Heritage City’ crown as it has so much history and style. The Wharf nestles elegantly within the carefully maintained Sydney Gardens and is just a short walk from the city centre. Cruising from Bath on the Kennet and Avon, you’ll really get a chance to sample the beauty of the Cotswold’s, with Bristol, Bradford-on-Avon, Hungerford and Reading all within easy reach. Gloria|2 double, 1 double and 2 single or 4 single.| Semi traditional stern Free standing furniture2 shower/WC|19.81m (65ft)|Spacious and modern canal boat with cutting edge facilities. Sagittarius|5 double, 4 double and 2 single, 3 double and 4 single or 2 double and 6 single.| New for 2019 Cruiser sternMicrowaveCafetiereShower/WCSeperate WC|21.03m (69ft)|Modern and spacious canal boat with a versatile layout and large stern deck ideal larger groups of friends or family. Phoenix|2 double, 1 double and 2 single or 4 single.| Semi traditional stern Free standing furniture2 shower/WC|19.81m (65ft)|Spacious and modern canal boat with cutting edge facilities. Englishcombe|2 double or 1 double and 2 single.| Cruiser stern Double glazed front windowsFull size shower/WC|17.68m (58ft)|A roomy four berth, ideal for a family. Langton|2 double and 8 single.| Semi traditional stern Free standing furnitureShower/WC|21.03m (69ft)|Spacious and modern canal boat with cutting edge facilities. Blake|3 double, 2 double and 2 single or 1 double and 4 single.| Cruiser stern MicrowaveFitted carpets (saloon and cabins)Shower/WCSeparate WC|18.30m (60ft)|Flexible berth arrangements in this well appointed and compact boat. Silvia|3 double, 2 double and 2 single, 1 double and 4 single or 6 single.| Semi-traditional stern Solid fuel stoveSpacious aft and forward deckAsh and lightwood interior2 shower/WCs|20.42m (67ft)|More room to relax, space to chill out and flexible but private sleeping areas. Tranquility|2 double and 4 single.| Cruiser stern Fixed doubleShower/WCSeparate WC|19.51m (64ft)|A well appointed and popular boat comfortably accommodating larger families or groups. Bradbury|3 double, 2 double and 2 single, 1 double and 4 single or 6 single.| Semi-traditional stern Solid fuel stoveSpacious aft and forward deckAsh and lightwood interior2 full size shower/WCs|20.42m (67ft)|More room to relax, space to chill out and flexible but private sleeping areas. Golden Eagle|1 double.| Semi-traditional stern Multi fuel stoveMicrowaveFreezerFree standing armchairs and dining furnitureShower/WC|17.37m (57ft)|Spacious canal boat, perfect for couples.